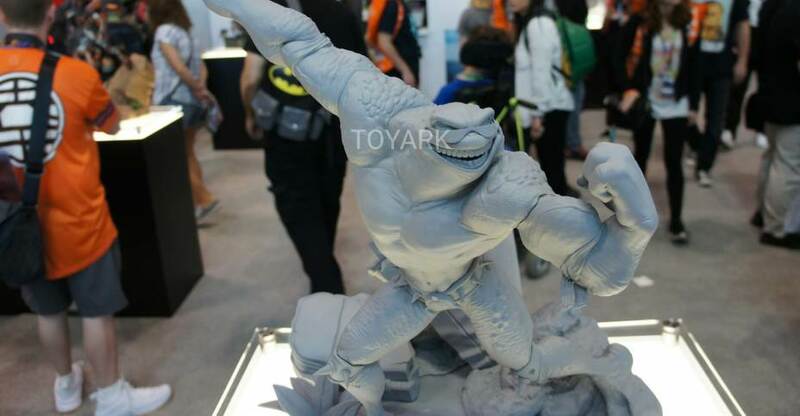 A new statue set by TriForce has been revealed. 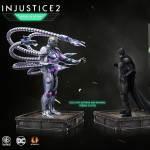 The new 2-pack includes both Batman and Braniac based on their appearances in the upcoming Injustice 2 video game. Each statue comes on a themed base. The set is priced at $99.99 with a release date set for the second quarter of 2017. See the official details below and read on for a few images. Prepare for larger-than-life showdowns as the greatest DC Super Heroes and Super-Villains do battle in INJUSTICE 2. The super powered sequel to the hit game Injustice: Gods Among Us, INJUSTICE 2 features a massive cast of iconic DC characters and an epic, cinematic storyline. – Premium Batman and Brainiac Statues: The Dark Knight and the Collector of Worlds go head-to-head and prepare for battle with two, highly-detailed collectable statues. A game-accurate replica of these two DC Comics legends, Batman stands at 9.02” and Brainiac stands at 10.98” (with tentacles). – Exclusive Lithograph: Own a piece of exclusive artwork showcasing Brainiac. 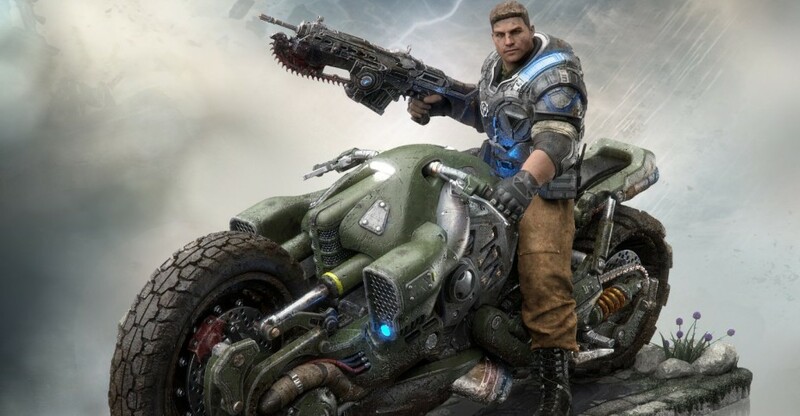 The Gears of War 4: Collector’s Edition includes: Gears of War 4 Ultimate Edition Steelbook + Season Pass, JD Fenix on COG Bike Premium Statue (19 inches in length), Excluisve Lithograph, Frag Grenade Keychain (6 inches in length), In Game Bonus Content Including 3 Gears Crates, and a Premium Packaging Box. 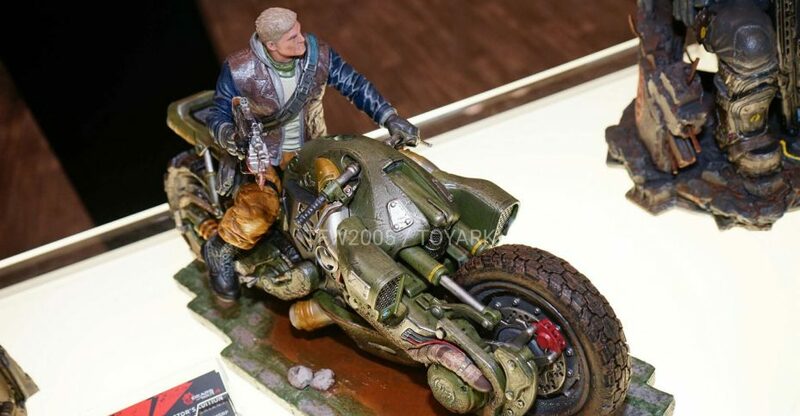 The Gears of War 4: Collector’s Edition – Outsider includes: Gears of War 4 Ultimate Edition Steelbook + Season Pass, JD Fenix on COG Bike Premium Statue Outsider Variant (19 inches in Length, 11 Inches in Height), Exclusive Lithograph, Frag Grenade Keychain (6 inches in length), In Game Bonus Content Including 3 Gears Crates, and a Premium Packaging Box. The set is priced at $249.99. You can see a few images by reading on. 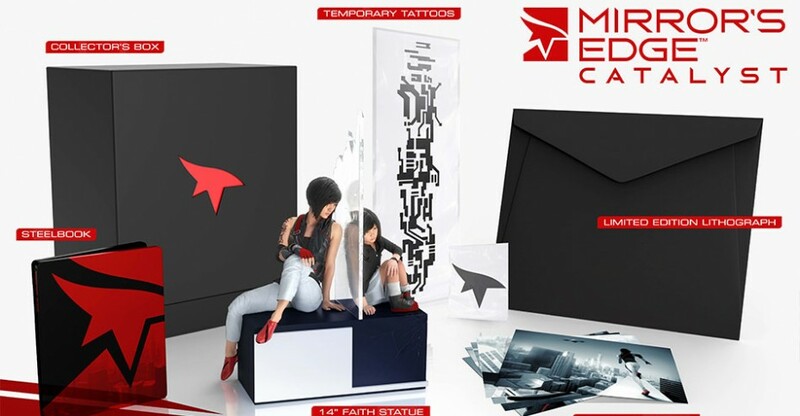 TriForce proudly presents the officially licensed Mirror’s Edge Catalyst Collector’s Edition Bundle, masterfully sculpted and painted by the artisans at TriForce. The end result is the most authentic representation of Faith and young Faith. The Faith statue is hand-finished and hand-painted to precision quality, measuring in at 10” in Width, 14” in Height, and weighs in at 6 pounds! Own this authentic piece of video game history as part of a Limited Edition. Faithful fans and new ones alike, we are pleased to unveil the Mirror’s Edge Catalyst Collector’s Edition. 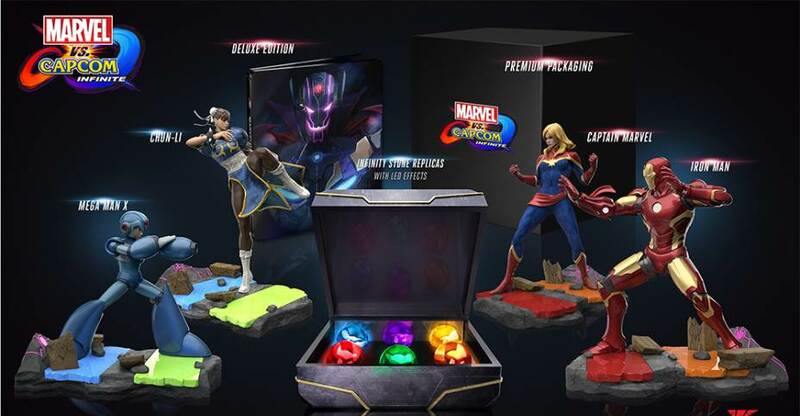 The Collector’s Edition was made to help foster player’s affinity with our heroine, Faith, as she grows up and makes a stand against oppression, represented by a beautiful adult and young Faith real life diorama that stands 14 inches tall. Players can also join Faith’s fight as part of the runner’s group in the city of Glass with temporary tattoos, or go behind-the-scenes to see more about the game’s creation through concept art and an exclusive lithograph. The Mirror’s Edge Catalyst Collectors Edition Bundle is scheduled for release in May. It’s priced at $149.99. You can see the new photos by reading on. Batman: Arkham Origins introduced fans the Black Mask from the Arkham game universe. Roman Sionis is an extremely powerful mob boss in Gotham City. He leads a group known as the False Facers. While in the comics, the mask is a permanent part of his face, in the game he wears it as a symbol that he uses to strike fear and terror. This also allows him to run his “legitimate” businesses without the general public knowing that he is the Black Mask. Unfortunately for him, he draws the ire of The Joker, who kidnaps and tortures him, all while assuming the persona of the Black Mask to draw out and kill Batman. TriForce has taken some of the astounding game designs for Black Mask and crafted this new collectible set. 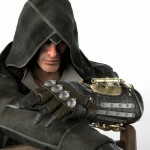 The Black Mask Arsenal includes a replica of the Black Mask itself, a pair of Knuckle Dusters and a base, which features an assortment of False Facer masks. This replica set is available now from TriForce, with a limited time price of just $200, which is half off the regular price! 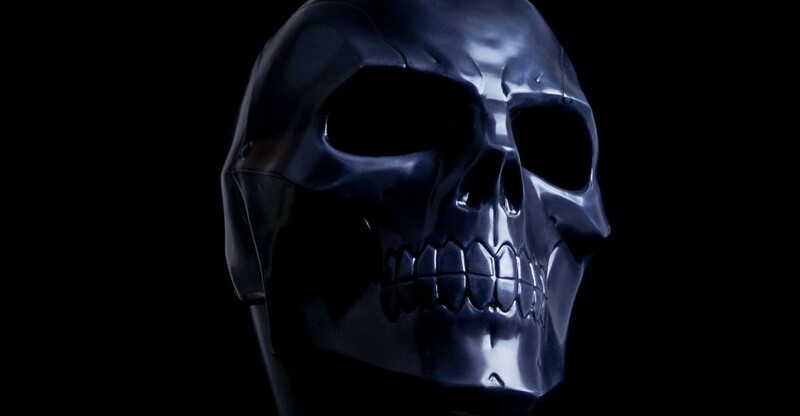 Today we have a gallery and review of the Black Mask Arsenal Full Scale Replica Set. After the jump, you will find over 55 high resolution photos and my thoughts on the collectible. TriForce proudly presents the officially licensed XCOM 2: Beam Pistol Full-Scale Replica, masterfully sculpted and painted by the artisans at TriForce. 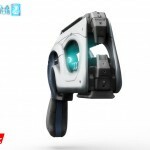 The end result is the most authentic representation of this weapon available on the market. The XCOM 2: Beam Pistol Full-Scale Replica is hand-finished and hand-painted to precision quality. Intricately crafted and cast in polystone, it measures 12.3″ in length, weighs in at 7 pounds, and features working LED effects! Own this authentic piece of videogame history. You can see new images by reading on. It has been officially revealed that the new version Doom is hitting consoles and PC’s this May! Collectible fans will want to take note of the upcoming Doom Collector’s Edition. That will include a 12″ tall Revenant Statue by TriForce. The statue base features LED lights and a slow spinning turbine! The creppy and stunning looking Revenant itself is modeled from the actual in-game 3D files. The collector’s edition of Doom will run $119.99 and the game will be available for Xbox One, PS4, and PC. Check out an image by reading on.